We eat a lot of salads, as meals. So to avoid the lettuce, tomato, cucumber snoozefest, I’m always on the lookout for something new to throw in the bowl. A few weeks ago it was a branch of delightful Barhi dates from Flying Disc Ranch. 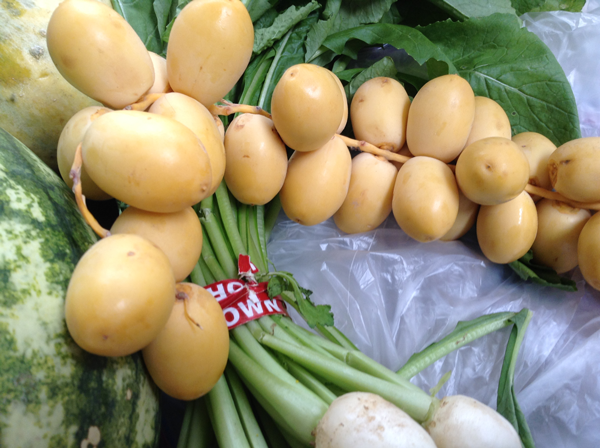 Fresh Barhi dates–bright yellow and firm–are usually only available August through September, but maybe, just maybe, you might spot some still hanging around the market. If so, grab them. In their fresh state, they are crunchy and slightly sweet with flavors of honey and coconut, and they make a wonderful counterpoint to the bitterness of the dandelion greens and peppery nasturtium flowers. Whisk the dressing ingredients until emulsified. 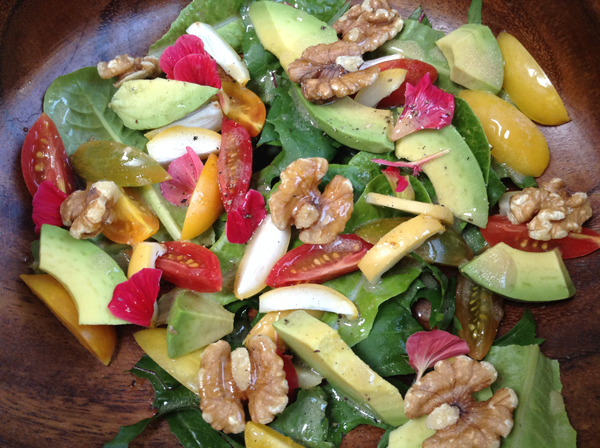 Add the salad ingredients to a large bowl and drizzle with the dressing until you have just enough. You might not need it all. Add a few grinds of black pepper to taste. Toss. These look amazing. Thanks for introducing them!